Proprietary Name: Losartan Potassium And Hydrochlorothiazide What is the Proprietary Name? Losartan Potassium And Hydrochlorothiazide with NDC 70518-1943 is a a human prescription drug product labeled by Remedyrepack Inc.. The generic name of Losartan Potassium And Hydrochlorothiazide is losartan potassium and hydrochlorothiazide. The product's dosage form is tablet, film coated and is administered via oral form. FDA Application Number: ANDA091617 What is the FDA Application Number? are indicated for the treatment of hypertension, to lower blood pressure. Lowering blood pressure lowers the risk of fatal and non-fatal cardiovascular (CV) events, primarily strokes and myocardial infarction. These benefits have been seen in controlled trials of antihypertensive drugs from a wide variety of pharmacologic classes including losartan and hydrochlorothiazide. [see Clinical Studies (14) and Dosage and Administration (2.1)]. Losartan potassium and hydrochlorothiazide tablets USP may be administered with other antihypertensive agents. Losartan potassium and hydrochlorothiazide tablets USP are indicated to reduce the risk of stroke in patients with hypertension and left ventricular hypertrophy, but there is evidence that this benefit does not apply to Black patients. [see Clinical Studies (14.2)]. Initiate a patient whose blood pressure is not adequately controlled with losartan 50 mg monotherapy with losartan potassium and hydrochlorothiazide tablet 50/12.5 once daily. If blood pressure remains uncontrolled after about 3 weeks of therapy, the dosage may be increased to two tablets of losartan potassium and hydrochlorothiazide tablet 50/12.5 once daily or one tablet of 100/25 once daily. Initiate a patient whose blood pressure is not adequately controlled with losartan 100 mg monotherapy with losartan potassium and hydrochlorothiazide tablet 100/12.5 (losartan 100 mg/hydrochlorothiazide 12.5 mg) once daily. If blood pressure remains uncontrolled after about 3 weeks of therapy, increase the dose to two tablets of losartan potassium and hydrochlorothiazide tablet 50/12.5 once daily or one tablet of losartan potassium and hydrochlorothiazide tablet 100/25 once daily. Initiate a patient whose blood pressure is inadequately controlled with hydrochlorothiazide 25 mg once daily, or is controlled but who experiences hypokalemia with this regimen, on losartan potassium and hydrochlorothiazide tablet 50/12.5 once daily, reducing the dose of hydrochlorothiazide without reducing the overall expected antihypertensive response. Evaluate the clinical response to losartan potassium and hydrochlorothiazide tablet 50/12.5 and, if blood pressure remains uncontrolled after about 3 weeks of therapy, increase the dose to two tablets of losartan potassium and hydrochlorothiazide tablet 50/12.5 once daily or one tablet of losartan potassium and hydrochlorothiazide tablet 100/25 once daily. · 50 mg/12.5 mg are yellow coloured, tear drop shaped, biconvex film coated tablets debossed with ‘L146’ on one side and plain on other side.· 100 mg/12.5 mg are white coloured, oval shaped, biconvex film coated tablets debossed with ‘L144’ on one side and plain on other side.· 100 mg/25 mg are yellow coloured, tear drop shaped, biconvex film coated tablets debossed with ‘L145’ on one side and plain on other side. In patients with an activated renin-angiotensin system, such as volume-or salt-depleted patients (e.g., those being treated with high doses of diuretics), symptomatic hypotension may occur after initiation of treatment with losartan potassium and hydrochlorothiazide tablets. Correct volume or salt depletion prior to administration of losartan potassium and hydrochlorothiazide tablets. Do not use losartan potassium and hydrochlorothiazide tablets as initial therapy in patients with intravascular volume depletion. [see Drug Interactions (7.3) and Use in Specific Populations (8.8)]. [see Drug Interactions (7.1)].Hydrochlorothiazide may alter glucose tolerance and raise serum levels of cholesterol and triglycerides. Hyperuricemia may occur or frank gout may be precipitated in patients receiving thiazide therapy. Because losartan decreases uric acid, losartan in combination with hydrochlorothiazide attenuates the diuretic-induced hyperuricemia. Hydrochlorothiazide decreases urinary calcium excretion and may cause elevations of serum calcium. Monitor calcium levels. Because clinical trials are conducted under widely varying conditions, adverse reaction rates observed in the clinical trials of a drug cannot be directly compared to rates in the clinical trials of another drug and may not reflect the rates observed in practice. Losartan potassium-hydrochlorothiazide has been evaluated for safety in 858 patients treated for essential hypertension and 3889 patients treated for hypertension and left ventricular hypertrophy. Most adverse reactions have been mild and transient in nature and have not required discontinuation of therapy. In controlled clinical trials, discontinuation of therapy due to clinical adverse events was required in only 2.8% and 2.3% of patients treated with the combination and placebo, respectively.In these double-blind controlled clinical trials, adverse reactions occurring in greater than 2% of subjects treated with losartan-hydrochlorothiazide and at a greater rate than placebo were: back pain (2.1% vs 0.6%), dizziness (5.7% vs 2.9%), and upper respiratory infection (6.1% vs 4.6%). The following additional adverse reactions have been reported in clinical trials with losartan potassium and hydrochlorothiazide tablets and/or the individual components: Blood and the lymphatic system disorders: Anemia, aplastic anemia, hemolytic anemia, leukopenia, agranulocytosis. Metabolism and nutrition disorders: Anorexia, hyperglycemia, hyperuricemia, electrolyte imbalance including hyponatremia and hypokalemia. Nervous system disorders: Dysgeusia, headache, migraine, paraesthesias. Eye disorders: Xanthopsia, transient blurred vision. Vascular disorders: Dose-related orthostatic effects, necrotizing angiitis (vasculitis, cutaneous vasculitis). Respiratory, thoracic and mediastinal disorders: Nasal congestion, pharyngitis, sinus disorder, respiratory distress (including pneumonitis and pulmonary edema). Gastrointestinal disorders: Dyspepsia, abdominal pain, gastric irritation, cramping, diarrhea, constipation, nausea, vomiting, pancreatitis, sialoadenitis. Hepato-biliary disorders: Jaundice (intrahepatic cholestatic jaundice). Skin and subcutaneous tissue disorders: Rash, pruritus, purpura, toxic epidermal necrolysis, urticaria, photosensitivity, cutaneous lupus erythematosus. Musculoskeletal and connective tissue disorders: Muscle cramps, muscle spasm, myalgia, arthralgia. Renal and urinary disorders: Glycosuria, renal dysfunction, interstitial nephritis, renal failure. Reproductive system and breast disorders: Erectile dysfunction/impotence. General disorders and administration site conditions: Chest pain, edema/swelling, malaise, fever, weakness. These studies demonstrate that the incidence of cough associated with losartan therapy, in a population that all had cough associated with ACE-inhibitor therapy, is similar to that associated with hydrochlorothiazide or placebo therapy. Cases of cough, including positive re-challenges, have been reported with the use of losartan in postmarketing experience. The following adverse reactions have been identified during post-approval use of losartan potassium and hydrochlorothiazide tablets. Because these reactions are reported voluntarily from a population of uncertain size, it is not always possible to estimate their frequency reliably or to establish a causal relationship to drug exposure. Digestive: Hepatitis has been reported rarely in patients treated with losartan. Hypersensitivity: Angioedema, including swelling of the larynx and glottis, causing airway obstruction and/or swelling of the face, lips, pharynx, and/or tongue has been reported rarely in patients treated with losartan; some of these patients previously experienced angioedema with other drugs including ACE inhibitors. Vasculitis, including Henoch-Schönlein purpura, has been reported with losartan. Anaphylactic reactions have been reported. 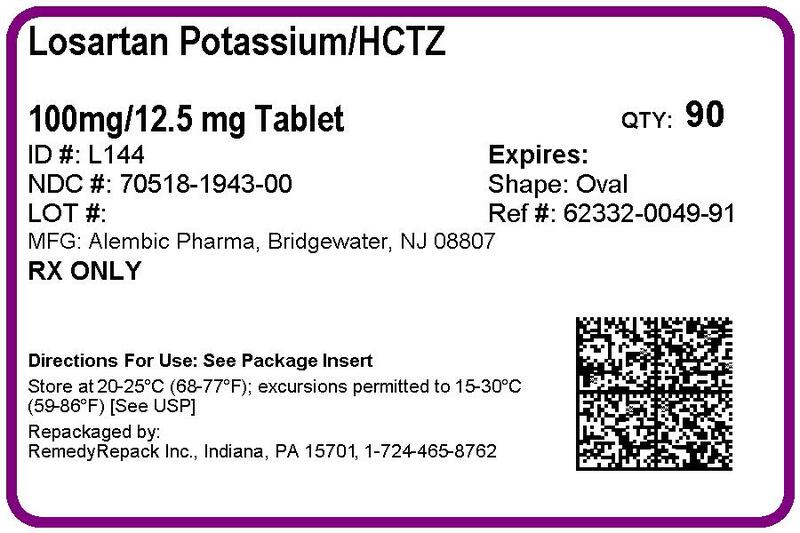 Coadministration of losartan with other drugs that raise serum potassium may result in hyperkalemia. Monitor serum potassium in such patients. Increases in serum lithium concentrations and lithium toxicity have been reported with concomitant use of angiotensin II receptor antagonists or thiazide diuretics. Monitor lithium levels in patients receiving losartan potassium and hydrochlorothiazide tablets and lithium. The administration of a non-steroidal anti-inflammatory agent including a selective COX-2 inhibitor can reduce the diuretic, natriuretic, and antihypertensive effects of loop, potassium-sparing and thiazide diuretics. Therefore, when losartan potassium and hydrochlorothiazide tablets and non-steroidal anti-inflammatory agents including selective COX-2 inhibitors are used concomitantly, observe closely to determine if the desired effect of the diuretic is obtained. In patients receiving diuretic therapy, coadministration of NSAIDs with angiotensin receptor blockers, including losartan, may result in deterioration of renal function, including possible acute renal failure. These effects are usually reversible. Monitor renal function periodically in patients receiving hydrochlorothiazide, losartan, and NSAID therapy. Dual blockade of the RAS with angiotensin receptor blockers, ACE inhibitors, or aliskiren is associated with increased risks of hypotension, syncope, hyperkalemia, and changes in renal function (including acute renal failure) compared to monotherapy. The Veterans Affairs Nephropathy in Diabetes (VA NEPHRON-D) trial enrolled 1448 patients with type 2 diabetes, elevated urinary-albumin-to-creatinine ratio, and decreased estimated glomerular filtration rate (GFR 30 to 89.9 mL/min), randomized them to lisinopril or placebo on a background of losartan therapy and followed them for a median of 2.2 years. Patients receiving the combination of losartan and lisinopril did not obtain any additional benefit compared to monotherapy for the combined endpoint of decline in GFR, end-stage renal disease, or death, but experienced an increased incidence of hyperkalemia and acute kidney injury compared with the monotherapy group. Closely monitor blood pressure, renal function, and electrolytes in patients on losartan potassium and hydrochlorothiazide tablets and other agents that affect the RAS. Do not coadminister aliskiren with losartan potassium and hydrochlorothiazide tablets in patients with diabetes. Avoid use of aliskiren with losartan potassium and hydrochlorothiazide tablets in patients with renal impairment (GFR <60 mL/min). [see Clinical Pharmacology (12.3)]: Antidiabetic drugs (oral agents and insulin) — dosage adjustment of the antidiabetic drug may be required. There was no evidence of teratogenicity in rats or rabbits treated with a maximum losartan potassium dose of 10 mg/kg/day in combination with 2.5 mg/kg/day of hydrochlorothiazide. At these dosages, respective exposures (AUCs) of losartan, its active metabolite, and hydrochlorothiazide in rabbits were approximately 5, 1.5, and 1 times those achieved in humans with 100 mg losartan in combination with 25 mg hydrochlorothiazide. AUC values for losartan, its active metabolite and hydrochlorothiazide, extrapolated from data obtained with losartan administered to rats at a dose of 50 mg/kg/day in combination with 12.5 mg/kg/day of hydrochlorothiazide, were approximately 6, 2, and 2 times greater than those achieved in humans with 100 mg of losartan in combination with 25 mg of hydrochlorothiazide. Fetal toxicity in rats, as evidenced by a slight increase in supernumerary ribs, was observed when females were treated prior to and throughout gestation with 10 mg/kg/day losartan in combination with 2.5 mg/kg/day hydrochlorothiazide. As also observed in studies with losartan alone, adverse fetal and neonatal effects, including decreased body weight, renal toxicity, and mortality, occurred when pregnant rats were treated during late gestation and/or lactation with 50 mg/kg/day losartan in combination with 12.5 mg/kg/day hydrochlorothiazide. Respective AUCs for losartan, its active metabolite and hydrochlorothiazide at these dosages in rats were approximately 35, 10 and 10 times greater than those achieved in humans with the administration of 100 mg of losartan in combination with 25 mg hydrochlorothiazide. When hydrochlorothiazide was administered without losartan to pregnant mice and rats during their respective periods of major organogenesis, at doses up to 3000 and 1000 mg/kg/day, respectively, there was no evidence of harm to the fetus. Thiazides cross the placental barrier and appear in cord blood. There is a risk of fetal or neonatal jaundice, thrombocytopenia, and possibly other adverse reactions that have occurred in adults. in utero exposure to losartan potassium and hydrochlorothiazide tablets: If oliguria or hypotension occurs, direct attention toward support of blood pressure and renal perfusion. Exchange transfusion or dialysis may be required as means of reversing hypotension and/or substituting for disordered renal function. Initiation of losartan potassium and hydrochlorothiazide tablet is not recommended for patients with hepatic impairment because the appropriate starting dose of losartan, 25 mg, is not available. [see Dosage and Administration (2.1), Warnings and Precautions (5.4), and Clinical Pharmacology (12.3)]. Safety and effectiveness of losartan potassium and hydrochlorothiazide tablets in patients with severe renal impairment (creatinine clearance <30 mL/min) have not been established. 50 of hydrochlorothiazide is greater than 10 g/kg in both mice and rats. The most common signs and symptoms observed are those caused by electrolyte depletion (hypokalemia, hypochloremia, hyponatremia) and dehydration resulting from excessive diuresis. If digitalis has also been administered, hypokalemia may accentuate cardiac arrhythmias. The degree to which hydrochlorothiazide is removed by hemodialysis has not been established. 1 receptor subtype and a diuretic, hydrochlorothiazide. Hydrochlorothiazide, USP is a white, or practically white, crystalline powder with a molecular weight of 297.74, which is slightly soluble in water, but freely soluble in sodium hydroxide solution. Losartan potassium and hydrochlorothiazide tablets USP are available for oral administration in three tablet combinations of losartan USP and hydrochlorothiazide USP. Losartan potassium and hydrochlorothiazide tablet USP 50 mg/12.5 mg contain 50 mg of losartan potassium USP and 12.5 mg of hydrochlorothiazide USP. Losartan potassium and hydrochlorothiazide tablet USP 100 mg/12.5 mg contain 100 mg of losartan potassium USP and 12.5 mg of hydrochlorothiazide USP. Losartan potassium and hydrochlorothiazide tablet USP 100 mg/25 mg contain 100 mg of losartan potassium USP and 25 mg of hydrochlorothiazide USP. Inactive ingredients are microcrystalline cellulose, lactose monohydrate, pregelatinized starch, magnesium stearate, hydroxypropyl cellulose, hypromellose, and titanium dioxide. Losartan potassium and hydrochlorothiazide tablet USP 50 mg/12.5 mg and 100 mg/25 mg also contain D&C yellow No. 10 aluminum lake. Losartan potassium and hydrochlorothiazide tablet USP 50 mg/12.5 mg contain 4.24 mg (0.108 mEq) of potassium, losartan potassium and hydrochlorothiazide tablet USP 100 mg/12.5 mg contain 8.48 mg (0.216 mEq) of potassium, and losartan potassium and hydrochlorothiazide tablet USP 100 mg/25 mg contain 8.48 mg (0.216 mEq) of potassium. USP dissolution test is pending. Hydrochlorothiazide is a thiazide diuretic. Thiazides affect the renal tubular mechanisms of electrolyte reabsorption, directly increasing excretion of sodium and chloride in approximately equivalent amounts. Indirectly, the diuretic action of hydrochlorothiazide reduces plasma volume, with consequent increases in plasma renin activity, increases in aldosterone secretion, increases in urinary potassium loss, and decreases in serum potassium. The renin-aldosterone link is mediated by angiotensin II, so coadministration of an angiotensin II receptor antagonist tends to reverse the potassium loss associated with these diuretics. The mechanism of the antihypertensive effect of thiazides is unknown. After oral administration of hydrochlorothiazide, diuresis begins within 2 hours, peaks in about 4 hours, and lasts about 6 to 12 hours. Drug Interactions Hydrochlorothiazide Alcohol, barbiturates, or narcotics — potentiation of orthostatic hypotension may occur. max but has only minor effects on losartan AUC or on the AUC of the metabolite (~10% decrease). The pharmacokinetics of losartan and its active metabolite are linear with oral losartan doses up to 200 mg and do not change over time. Metabolism: Losartan is an orally active agent that undergoes substantial first-pass metabolism by cytochrome P450 enzymes. It is converted, in part, to an active carboxylic acid metabolite that is responsible for most of the angiotensin II receptor antagonism that follows losartan treatment. About 14% of an orally-administered dose of losartan is converted to the active metabolite. In addition to the active carboxylic acid metabolite, several inactive metabolites are formed. In vitro studies indicate that cytochrome P450 2C9 and 3A4 are involved in the biotransformation of losartan to its metabolites. 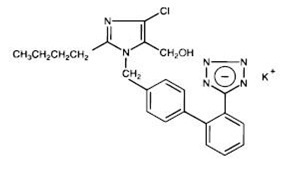 14C-labeled losartan, about 45% of radioactivity is recovered in the urine and 50% in the feces. Neither losartan nor its metabolite accumulate in plasma upon repeated once-daily dosing. [see Warnings and Precautions (5.3) and Use in Specific Populations (8.7)]. No clinically significant drug interactions have been found in studies of losartan potassium with hydrochlorothiazide, digoxin, warfarin, cimetidine and phenobarbital. However, rifampin has been shown to decrease the AUC of losartan and its active metabolite by 30% and 40%, respectively. Fluconazole, an inhibitor of cytochrome P450 2C9, decreased the AUC of the active metabolite by approximately 40%, but increased the AUC of losartan by approximately 70% following multiple doses. Conversion of losartan to its active metabolite after intravenous administration is not affected by ketoconazole, an inhibitor of P450 3A4. The AUC of active metabolite following oral losartan was not affected by erythromycin, an inhibitor of P450 3A4, but the AUC of losartan was increased by 30%. The pharmacodynamic consequences of concomitant use of losartan and inhibitors of P450 2C9 have not been examined. Subjects who do not metabolize losartan to active metabolite have been shown to have a specific, rare defect in cytochrome P450 2C9. These data suggest that the conversion of losartan to its active metabolite is mediated primarily by P450 2C9 and not P450 3A4. in vitro chromosomal aberration assay in Chinese hamster ovary cells at noncytotoxic concentrations. in vitro chromosomal aberration assays. Aspergillus nidulans non-disjunction assay at an unspecified concentration. Reduction in the Risk of Stroke: The LIFE study was a multinational, double-blind study comparing losartan and atenolol in 9193 hypertensive patients with ECG-documented left ventricular hypertrophy. Patients with myocardial infarction or stroke within six months prior to randomization were excluded. Patients were randomized to receive once daily losartan 50 mg or atenolol 50 mg. If goal blood pressure (<140/90 mmHg) was not reached, hydrochlorothiazide (12.5 mg) was added first and, if needed, the dose of losartan or atenolol was then increased to 100 mg once daily. If necessary, other antihypertensive treatments (e.g., increase in dose of hydrochlorothiazide therapy to 25 mg or addition of other diuretic therapy, calcium channel blockers, alpha-blockers, or centrally acting agents, but not ACE inhibitors, angiotensin II antagonists, or beta-blockers) were added to the treatment regimen to reach the goal blood pressure. In efforts to control blood pressure, the patients in both arms of the LIFE study were coadministered hydrochlorothiazide the majority of time they were on study drug (73.9% and 72.4% of days in the losartan and atenolol arms, respectively). Of the randomized patients, 4963 (54%) were female and 533 (6%) were Black. The mean age was 67 with 5704 (62%) age ≥65. At baseline, 1195 (13%) had diabetes, 1326 (14%) had isolated systolic hypertension, 1469 (16%) had coronary heart disease, and 728 (8%) had cerebrovascular disease. Baseline mean blood pressure was 174/98 mmHg in both treatment groups. The mean length of follow-up was 4.8 years. At the end of study or at the last visit before a primary endpoint, 77% of the group treated with losartan and 73% of the group treated with atenolol were still taking study medication. Of the patients still taking study medication, the mean doses of losartan and atenolol were both about 80 mg/day, and 15% were taking atenolol or losartan as monotherapy, while 77% were also receiving hydrochlorothiazide (at a mean dose of 20 mg/day in each group). Blood pressure reduction measured at trough was similar for both treatment groups but blood pressure was not measured at any other time of the day. At the end of study or at the last visit before a primary endpoint, the mean blood pressures were 144.1/81.3 mmHg for the group treated with losartan and 145.4/80.9 mmHg for the group treated with atenolol [the difference in SBP of 1.3 mmHg was significant (p<0.001), while the difference of 0.4 mmHg in DBP was not significant (p=0.098)]. The primary endpoint was the first occurrence of cardiovascular death, nonfatal stroke, or nonfatal myocardial infarction. Patients with nonfatal events remained in the trial, so that there was also an examination of the first event of each type even if it was not the first event (e.g., a stroke following an initial myocardial infarction would be counted in the analysis of stroke). Treatment with losartan resulted in a 13% reduction (p=0.021) in risk of the primary endpoint compared to the atenolol group; this difference was primarily the result of an effect on fatal and nonfatal stroke. Treatment with losartan reduced the risk of stroke by 25% relative to atenolol (p=0.001). The 3 controlled studies of losartan and hydrochlorothiazide included over 1300 patients assessing the antihypertensive efficacy of various doses of losartan (25, 50 and 100 mg) and concomitant hydrochlorothiazide (6.25, 12.5 and 25 mg). A factorial study compared the combination of losartan/hydrochlorothiazide 50/12.5 mg with its components and placebo. The combination of losartan/hydrochlorothiazide 50/12.5 mg resulted in an approximately additive placebo-adjusted systolic/diastolic response (15.5/9 mmHg for the combination compared to 8.5/5 mmHg for losartan alone and 7/3 mmHg for hydrochlorothiazide alone). Another study investigated the dose-response relationship of various doses of hydrochlorothiazide (6.25, 12.5 and 25 mg) or placebo on a background of losartan (50 mg) in patients not adequately controlled (Sitting Diastolic Blood Pressure [SiDBP] 93 to 120 mmHg) on losartan (50 mg) alone. The third study investigated the dose-response relationship of various doses of losartan (25, 50 and 100 mg) or placebo on a background of hydrochlorothiazide (25 mg) in patients not adequately controlled (SiDBP 93 to 120 mmHg) on hydrochlorothiazide (25 mg) alone. These studies showed an added antihypertensive response at trough (24 hours post-dosing) of hydrochlorothiazide 12.5 or 25 mg added to losartan 50 mg of 5.5/3.5 and 10/6 mmHg, respectively. Similarly, there was an added antihypertensive response at trough when losartan 50 or 100 mg was added to hydrochlorothiazide 25 mg of 9/5.5 and 12.5/6.5 mmHg, respectively. There was no significant effect on heart rate. There was no difference in response for men and women or in patients over or under 65 years of age. Black patients had a larger response to hydrochlorothiazide than non-Black patients and a smaller response to losartan. The overall response to the combination was similar for Black and non-Black patients. Severe Hypertension (SiDBP ≥110 mmHg) The safety and efficacy of losartan potassium and hydrochlorothiazide tablets as initial therapy for severe hypertension (defined as a mean SiDBP ≥110 mmHg confirmed on 2 separate occasions off all antihypertensive therapy) was studied in a 6-week double-blind, randomized, multicenter study. Patients were randomized to either losartan and hydrochlorothiazide (50 mg/12.5 mg, once daily) or to losartan (50 mg, once daily) and followed for blood pressure response. Patients were titrated at 2-week intervals if their SiDBP did not reach goal (<90 mmHg). Patients on combination therapy were titrated from losartan 50 mg/hydrochlorothiazide 12.5 mg to losartan 50 mg/hydrochlorothiazide 12.5 mg (sham titration to maintain the blind) to losartan 100 mg/hydrochlorothiazide 25 mg. Patients on monotherapy were titrated from losartan 50 mg to losartan 100 mg to losartan 150 mg, as needed. The primary endpoint was a comparison at 4 weeks of patients who achieved goal diastolic blood pressure (trough SiDBP <90 mmHg). The study enrolled 585 patients, including 264 (45%) females, 124 (21%) blacks, and 21 (4%) ≥65 years of age. The mean blood pressure at baseline for the total population was 171/113 mmHg. The mean age was 53 years. After 4 weeks of therapy, the mean SiDBP was 3.1 mmHg lower and the mean SiSBP was 5.6 mmHg lower in the group treated with losartan potassium and hydrochlorothiazide tablets. As a result, a greater proportion of the patients on losartan potassium and hydrochlorothiazide tablets reached the target diastolic blood pressure (17.6% for losartan potassium and hydrochlorothiazide tablets, 9.4% for losartan; p=0.006). Similar trends were seen when the patients were grouped according to gender, race or age (<, ≥ 65). After 6 weeks of therapy, more patients who received the combination regimen reached target diastolic blood pressure than those who received the monotherapy regimen (29.8% versus 12.5%). StorageStore at 25°C (77°F); excursions permitted to 15° to 30°C (59° to 86°F) [See USP Controlled Room Temperature]. Keep container tightly closed. Protect from light. Read the Patient Information that comes with losartan potassium and hydrochlorothiazide tablets before you start taking it and each time you get a refill. There may be new information. This leaflet does not take the place of talking with your doctor about your condition and treatment. What is the most important information I should know about losartan potassium and hydrochlorothiazide tablets? • Losartan potassium and hydrochlorothiazide tablets can cause harm or death to an unborn baby. • Talk to your doctor about other ways to lower your blood pressure if you plan to become pregnant. • If you get pregnant while taking losartan potassium and hydrochlorothiazide tablets tell your doctor right away. What is losartan potassium and hydrochlorothiazide tablet? • lower high blood pressure (hypertension). Losartan potassium and hydrochlorothiazide tablet is not usually the first medicine used to treat high blood pressure. • lower the chance of stroke in patients with high blood pressure and a heart problem called left ventricular hypertrophy (LVH). Losartan potassium and hydrochlorothiazide tablet may not help Black patients with this problem. Losartan potassium and hydrochlorothiazide tablet has not been studied in children less than 18 years old. High Blood Pressure (hypertension). Blood pressure is the force in your blood vessels when your heart beats and when your heart rests. You have high blood pressure when the force is too much. The losartan ingredient in losartan potassium and hydrochlorothiazide tablet can help your blood vessels relax so your blood pressure is lower. The hydrochlorothiazide ingredient in losartan potassium and hydrochlorothiazide tablet works by making your kidneys pass more water and salt. Who should not take losartan potassium and hydrochlorothiazide tablets? • are allergic to any ingredients in losartan potassium and hydrochlorothiazide tablets. See a complete list of ingredients in losartan potassium and hydrochlorothiazide tablets at the end of this leaflet. • are not passing urine. • have diabetes and are taking a medicine called aliskiren to reduce blood pressure. • are pregnant or planning to become pregnant. • are breastfeeding or plan to breastfeed. Losartan potassium and hydrochlorothiazide can pass into your milk and may harm your baby. You and your doctor should decide if you will take losartan potassium and hydrochlorothiazide tablets or breastfeed. You should not do both. • have been vomiting (throwing up), having diarrhea, sweating a lot, or not drinking enough fluids. These could cause you to have low blood pressure. • other medicines to reduce blood pressure. Know the medicines you take. Keep a list of your medicines and show it to your doctor and pharmacist when you get a new medicine. How should I take losartan potassium and hydrochlorothiazide tablets? • Take losartan potassium and hydrochlorothiazide tablets exactly as prescribed by your doctor. Your doctor may change your dose if needed. • Losartan potassium and hydrochlorothiazide tablets can be taken with or without food. • If you miss a dose, take it as soon as you remember. If it is close to your next dose, do not take the missed dose. Just take the next dose at your regular time. • If you take too much losartan potassium and hydrochlorothiazide tablets, call your doctor or Poison Control Center, or go to the nearest hospital emergency room right away. • Your doctor may do blood tests from time to time while you are taking losartan potassium and hydrochlorothiazide tablets. What are the possible side effects of losartan potassium and hydrochlorothiazide tablets?
. Symptoms of an allergic reaction are swelling of the face, lips, throat, or tongue. Get emergency medical help right away and stop taking losartan potassium and hydrochlorothiazide tablets. Tell your doctor if you get any side effect that bothers you or that won’t go away. This is not a complete list of side effects. For a complete list, ask your doctor or pharmacist. How should I store losartan potassium and hydrochlorothiazide tablets? • Store losartan potassium and hydrochlorothiazide tablets at 25°C (77°F); excursions permitted to 15° to 30°C (59° to 86°F) [See USP Controlled Room Temperature]. • Keep losartan potassium and hydrochlorothiazide tablets in a tightly closed container, and keep losartan potassium and hydrochlorothiazide tablets out of the light. Medicines are sometimes prescribed for conditions that are not mentioned in patient information leaflets. Do not use losartan potassium and hydrochlorothiazide tablets for a condition for which it was not prescribed. Do not give losartan potassium and hydrochlorothiazide tablets to other people, even if they have the same symptoms that you have. It may harm them. This leaflet summarizes the most important information about losartan potassium and hydrochlorothiazide tablets. If you would like more information, talk with your doctor. You can ask your pharmacist or doctor for information that is written for health professionals. What are the ingredients in losartan potassium and hydrochlorothiazide tablets? microcrystalline cellulose, lactose monohydrate, pregelatinized starch, magnesium stearate, hydroxypropyl cellulose, hypromellose, and titanium dioxide. Losartan potassium and hydrochlorothiazide tablet USP 50 mg/12.5 mg and 100 mg/25 mg also contain D&C yellow No. 10 aluminum lake. Call your doctor for medical advice about side effects. You may report side effects to Alembic Pharmaceuticals Limited at 1-866-210-9797 or FDA at 1-800-FDA-1088.